Europe is currently facing a huge debt crisis which threatens to undo financial stability across the Euro Zone, with probable run-on effects for the US and other continents. Greece has racked up an enormous sovereign debt - because the government has too many credit cards - and without a solid financial backbone investors are avoiding the nation. As this situation worsens while France, Germany and other EU members propose a bailout package, the entire European continent faces infection as Greece drags down the Euro currency. 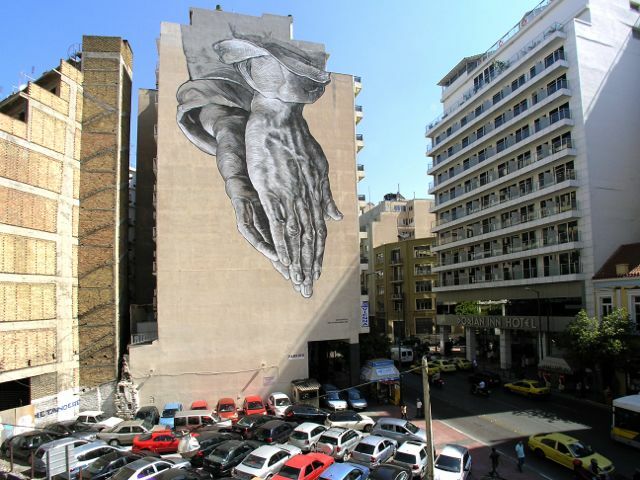 1) It signals God/Jesus/Michael Jackson pushing their hands down to earth to pray for Greece's financial recovery. 2) The hands are upside down, hinting the world is 'screwed'. 3) It represents an accurate line graph of the world's finances since the Global Financial Crisis of 2008.